As tensions steadily rose in the late 1850s, Helen was working as the principal of a female seminary in Kentucky, and her father had become the pastor of a congregation in Louisiana. Adeline and Frances, now also teachers, were employed near his church. Though the Ekins enjoyed their lives and occupations in the South, they were not sympathetic to the Confederacy. When Rev John Ekin received a letter from an old friend in 1860, the family was happy to read its contents. The Old Female Seminary from a vintage book on the history of Greene County, Ohio. The sketch of the Seminary accompanies an essay of Helen’s reminiscences of her family’s part in Xenia, Ohio’s history. This book was one of many sources I used in piecing together the family’s whereabouts during the War years. In the latter part of the 1850s, a large, imposing, three-story red brick building had been built on Third Street in Xenia, Ohio for use as a seminary. After a decade of name changes, leadership disruptions, and financial failure, the seminary had closed. The virtually new building had been shuttered and vacant. Rev RD Harper, then pastor of Xenia’s First United Presbyterian Church, thought his old friend, Rev John Ekin, might want to take a shot at re-opening the Female Seminary. He sent a letter to Louisiana with his suggestion, and the Ekins packed up and immediately set off for Ohio. John Ekin sent a letter to his eldest daughter in Kentucky asking her to meet her sisters in Xenia. John, Esther, and the younger girls would meet her there. Helen left her principal position in Georgetown, Kentucky, and made her way north to Ohio to the Old Union Female Seminary. 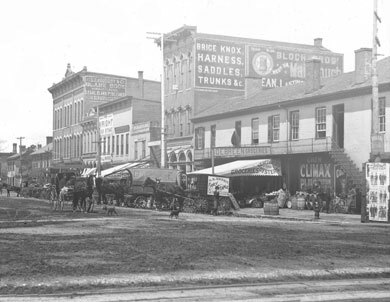 Vintage photograph of downtown Xenia, Ohio during the 1800s. This is how the town may have looked when the Ekin family arrived in 1860. Photo: Xenia, Greene County, Ohio– I found this image used in several different locations online. When the three sisters arrived—Helen, Adeline and Frances ahead of their parents and the younger kids, they immediately got to work. Since money was scarce, they couldn’t afford to hire help, so Helen, Adeline, and Frances cleaned the seminary from top to bottom. They washed windows, scrubbed the floors, and laid in provisions for their family and prospective students. They had not only done a wonderful job of setting up the school and their home, they did so with remarkable thrift. With only $50 in gold coins, the sisters ended the first school year with $15 in gold coins left. The townspeople of Xenia were impressed with the Ekin girls. This, undoubtedly, helped get the school off to a good start. Almost immediately they had several girls enrolled. The Ekins spent most of the Civil War in Xenia. In the days before the 24-hour news cycle, it could’ve been a frightening and unsure time. But by all accounts, the experience during the War at the Female Seminary was positive. They wrote of the joyful times spent playing games, studying, and socializing with the boys at the Male Seminary. Some of the girls enjoyed dancing, afternoon teas, socializing, and local excursions. 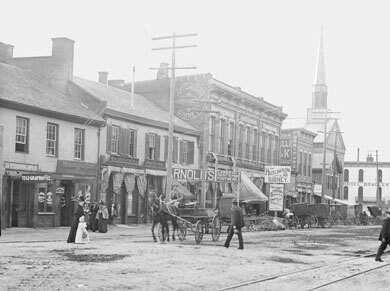 Vintage photograph of downtown Xenia, Ohio during the 1800s. This is how the town may have looked when the Ekin family arrived in 1860. Photo: Xenia, Greene County, Ohio. I found this photo used in several different locations online. There was talk of the War. One of Helen’s students was 12 year old Chessie Reid. Chessie’s family owned the Xenia Sentinel, and her older brother, once a tall, sunburned reporter for the town paper, had been dispatched to the front by the Cincinnati Gazette. As a front line war correspondent, J Whitelaw Reid (aka “Agate”) would soon become famous for his accounts of some of the most significant battles of the Civil War. Before his rise to fame, his eloquent and descriptive letters home kept everyone in Xenia—the Ekins included—better informed than the average American citizen of the time. In 1861, amid widespread rumors of raiding by William Quantrill’s guerillas, a Home Guard was established in Ohio to protect citizens. When the Guard arrived in Xenia after one such rumor to practice maneuvers and make their presence known, the townspeople were alarmed. Helen, Adeline, and Frances pulled up the bricks in their back parlor floor and dug a deep hole. In it, they buried their three $5 gold coins, solid silver spoons, and family daguerreotypes. Thankfully, Quantrill’s Raiders never appeared in Xenia. However, other towns were not so lucky. 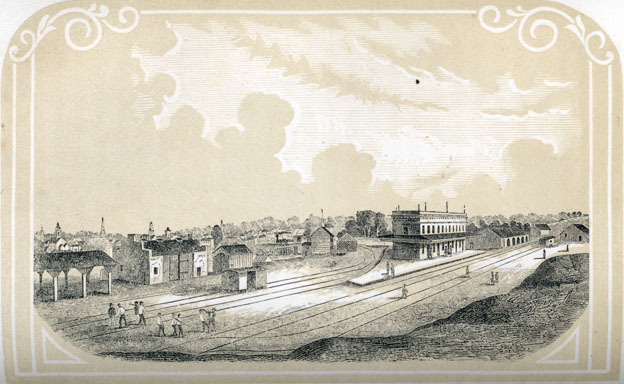 The train station in Xenia, Ohio as it appeared in the 1800’s. This is how the station may have looked when the freight cars filled with Union soldiers pulled into town and unloaded cars full of soldiers– invited guests of the town– for a feast before heading off to the front. Vintage postcard. Whitelaw’s vivid letters from the front brought the people of Xenia together in support of various soldier aid societies. Townspeople united in fellowship as news about loved ones reached home. Canned food, handmade socks and mittens, and other provisions were collected and sent to the front. When news that an Army Division would be passing through by train, Xenia extended an invitation for the boys in blue to stop in town for a square meal. The whole town cooked a memorable feast for the soldiers—the Seminary girls chipping in with over 44 dozen freshly baked biscuits and other items. Some of the soldiers tried to offer payment, but their money was refused. The trains pulled out of Xenia later that day full well-fed Union soldiers, each with extra provisions for the journey. J Whitelaw Reid, aka “Agate”, the (future) famous war correspondent from Xenia, Ohio. Whitelaw’s sister, Chessie, attended the Seminary while the Ekin sisters were teaching there, and his letters home provided them with vivid details of the war from strategic and important battlegrounds. Reid would also speak to the Seminary girls on the subject of women’s rights. It appears as though Xenia, Ohio had some progressive ideas when it came to women. Though the Women’s Rights Movement hadn’t begun to gain traction yet, J Whitelaw Reid spoke to the Wordsworth Literary Society at the Xenia Female Seminary at the June Commencement Exercises about “The New Woman’s-Rights.” The address was well attended, even with a $0.15 admission charge. Together with their father, Helen, Adeline, and Rachel ran the Female Seminary in Xenia for a few years. But, they wouldn’t stay unmarried teachers for long. The Ekin girls kept the Xenia City Hall marriage license desk pretty busy in 1864. William Starrett, Joseph Clokey, and Matthew Allison would all apply for marriage licences that year, and the three oldest Ekin girls would become married women and set out to forge paths of their own. What pluck and resourcefulness those Ekin sisters had! And how interesting to read about their (probable) reactions to the Civil War. I’ve always wondered what life must have been like for people like the Ekins, who were at the mercy of guerrilla raiders and passing armies and the shifting winds of war. How lucky for the people of Xenia that they had a connection to J Whitelaw Reid, though … and how fascinating that he took an interest in women’s rights. But above all, how wonderful that you’ve collected so many anecdotes about your ancestors, and strung them together so beautifully to create this vivid narrative. Thank you so much; can’t wait until the next installment! I can’t thank you enough for your comments! I think you are my most loyal follower– really, I don’t think my family even follows the blog! They THINK they know the stories, but they don’t know everything, and they are missing out! Thank you SO MUCH! I am a few posts ahead and I am just working on what images to include with the next post. The next few decades go off on a few historical tangents because if they don’t, the just don’t make sense. I am a history buff anyway, and I am learning al to about history. Stuff I never knew! I will see a word and not know what it means and look it up and it opens up all kinds of new information!!!! I wondered why My great grandmother went into such detail about Chessie Reid…. Now I know! What I really need to do is find Dellie and Frances’ descendants and see what kinds of pictures they have. I with I had pictures of John and Esther Ekin. And Dellie. THANK YOU for reading!!!! Anyway, it seems silly to say “you’re welcome” for my readership, because it truly is a joy and a pleasure to follow your posts — even if I may be absent for a few days due to extraordinary pressures at work. But rest assured that I will remain loyal … and that I’m already looking forward to these “necessary historical tangents” of which you speak! (Can’t wait, in fact.) Please keep up the superb writing. You really are fantastic.